The original recipe is from allrecipes.com, and it can be viewed here. Gisele Gaffney's adapted recipe below can be downloaded as a pdf here. 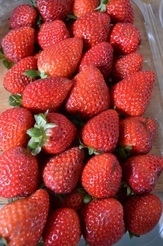 In a medium bowl stir together the rhubarb, strawberries and honey. Transfer to a shallow baking dish. In the same bowl, stir together the oats, chia or flaxseeds, brown sugar and cinnamon. Mix in the butter until crumbly, and spread over the top of the fruit. Bake 40 minutes in the preheated oven, until rhubarb is tender and the topping is toasted. Serve warm. Although rhubarb stalks are tart, a bit of sugar and heat easily mellow its strong sour flavor, and it is the perfect fit for both savory and sweet dishes. For many years, rhubarb has been paired with strawberries in its most famous form as a strawberry rhubarb pie! 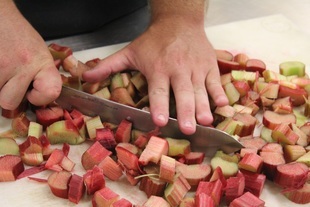 Cooks today are finding other culinary uses for this reddish colored, crisp, tart ingredient, and rhubarb is making its way into jams, soups, salsas, and stews. Rhubarb in Chelsea Community Garden.